Last week, one of my blog posts noted that the chocolate cupcakes I made weren't quite up to my expections. 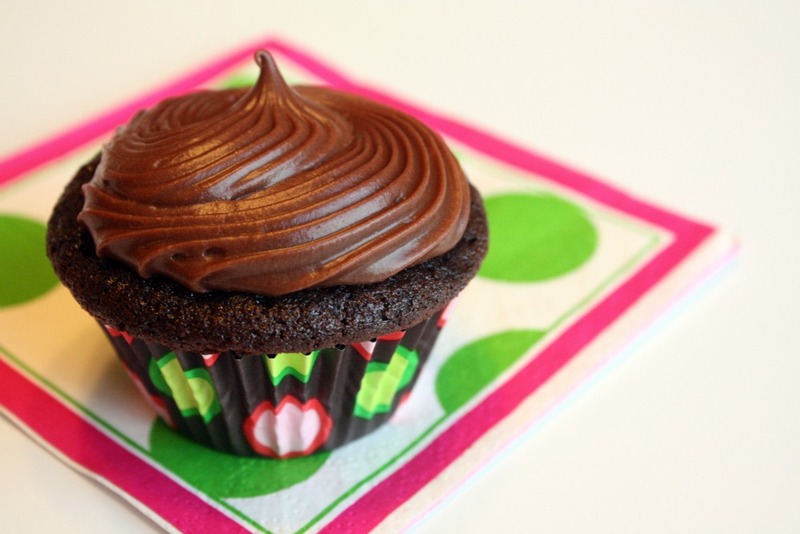 Within minutes, cooking contest buddy, Julie, pointed me to her favorite chocolate cupcake recipe. Since she's a contest winner, food blogger and granola goddess, I had no doubt they'd be delicious. I made them for my son's cast party, and boy did they live up to my expectations. They were tender, moist and very chocolatey. Plus, they made 30+ cupcakes, which was perfect for feeding a crowd of high school performers. Definitely a keeper recipe -- I'll be making this one again. Thanks, Julie! Makes about 36 cupcakes. To make as a cake, check out Julie's blog! In the bowl of an electric mixer fitted with the paddle attachment, beat the eggs until they are slightly thickened, about 3 minutes. Slowly add the canola oil, and mix at medium speed for 1 minute. Gradually add the sugar, mixing until well combined. Slowly add the buttermilk, coffee mixture, and vanilla, and mix until blended. In a large bowl, sift together the flour, cocoa powder, baking soda, baking powder, and salt. Add the dry ingredients to the batter in three additions on low speed, stopping to scrape down the sides of the bowl as necessary. The batter will be liquidy -- don't worry! Divide the batter among the prepared pans and bake until a toothpick inserted into the center emerges clean, 18-20 minutes, until a toothpick inserted into the center emerges clean. (For me, mini cupcakes took 20 minutes; regular took closer to 22 minutes, but I think my oven is slow.) Frost when completely cooled. Put chocolate chips in a heatproof bowl (I used the bowl of my electric mixer). Heat cream until bubbles form around the edge of the pan, then pour cream over the chocolate. Let sit for one minute, then stir until combined. Add butter and vanilla and stir until combined. Let cool for 10 minutes. Dump powdered sugar into the mixture (you're supposed to sift it but I never do). Beat until combined. Continue to beat with an electric mixer until lighter in color and creamy. I used a pastry bag with a large star tip to ice the cupcakes. Too much deliciousness for my eyes right now! Those look heavenly. Beautiful! There's nothing like a soft, chocolatey cupcake. It is entirely too early in the morning for me to already start fantasizing about chocolate cupcakes! I just got my hands on an "ultimate vegan chocolate cupcake." They were perfect for a vegan friend's birthday. I can't wait to try these non-vegan ones for myself! They look delicious!